Info It's been about a week since the shipwreck... Use the light to find the castaway. Save our Raft! is one of Jimmy T.'s microgames in WarioWare: Twisted! The name is a pun on the term "Save our ship!" 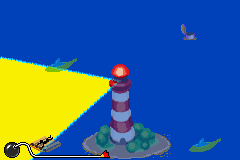 The game's purpose is to rotate the light so that it faces the man stranded on a raft. 1st level difficulty: The light is large and the only thing floating on water is the raft. 2nd level difficulty: The light is a bit smaller and there will be other things floating. 3rd level difficulty: The light is smaller and there will be empty rafts. This page was last edited on November 17, 2018, at 03:14.